Over the past few months I’ve gotten a lot of questions around my shopping habits. How do I decide what to buy? How much do I spend? How frequently do I shop? I thought I’d try to walk through a few of these questions in a couple of posts to share my thoughts, habits & preferences with you for those who are interested. First off – how do I decide what to buy? 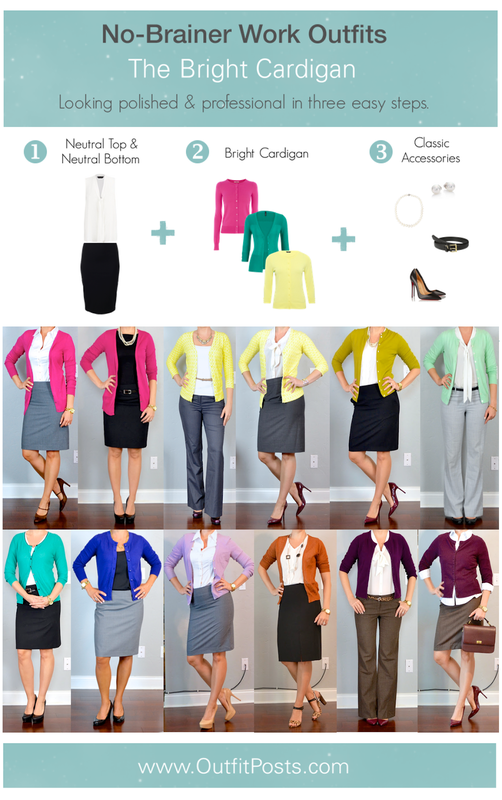 The way I organize my outfit inspiration photos is to dump them in seasonal Pinterest folders. Basically fall/winter & spring/summer. Any outfit photo that contains colors, shapes, ideas or similar items to those that I already own and is even remotely possible to use for outfit inspiration get saved. Oftentimes I find super cute outfits that I would love to recreate but unfortunately I don’t own anything slightly similar. Those pictures get saved in a “shopping ideas” folder. Over time I will notice trends to the items in the shopping folder – pieces of clothing that I can see being used in a lot of different ways and owning them would add some specific dimension currently missing from my wardrobe. Those items with both multiple pins & multiple uses get added to my short list of things I keep my eye out for when I’m shopping. I thought I’d share the items at the top of my current list with you. (I’ve already purchased three of them between when I jotted down items to list in this post and this actual posting.) The ‘similar’ links below are items similar to the ones in the image above. White Blazer – I love that adding a blazer on top of basic boring clothing pieces magically pulls them all together and transforms the look from separate items into an “outfit”. I currently own black, grey & navy blazers and basically only wear them for work. I have been wanting to incorporate a fun relaxed blazer into my casual looks and I think a light, bright casual white one could be a good jumping off point – especially for spring. 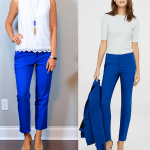 White Pointed Toe Pumps – The addition of pointed toe black pumps to my wardrobe a few months ago gave lots of my favorite work outfits an updated feel. I think a fun pair of pointed toe pumps in white would do the same for some of my favorite casual outfits. Trench Coat – Love love love a classic trench coat. I have a navy one from Banana Republic that is about 12 years old that I have worn to death and now has ripped lining, missing belt and some mysterious stains. I would love to find a upgraded replacement. Contrast Collar Shirt – I am always on the hunt for fun work clothes. My husband has a few button-down dress shirts that have contrasting collars and I think he looks super sharp when he wears them. Women’s version of the same shirt were all over the runway – which means they will be popping up in the stores this spring. Printed Wrap Dress – These dresses always seem to find their way onto “50 items every women must own” type lists. They are great for work, social events and just being casually fabulous. I love DVF’s patterns & colors but the price point is pretty steep. Neutral Sheath Dress – Some days my brain isn’t functioning in the morning when I’m getting dressed for work and I lose all ability to think critically about what sort of impression a particular outfit will have. This often happens when traveling for work and I am very low on sleep but I need to look polished & professional for an important meeting. I think suit/sheath dresses are the best no-brainer un-screw-up-able option. Put on one piece (plus perhaps a cardigan/jacket) and you’re done. Gold Link Necklace & Bracelet – I am slowly trying to upgrade some of my work appropriate jewelry from Target & Forever 21 type to better quality classic pieces. I think a basic set of gold chain necklace & bracelet is a great place to start. Hi, I have been reading your blog for quite a while and I love it, so I thought it was time to leave a comment to let you know. 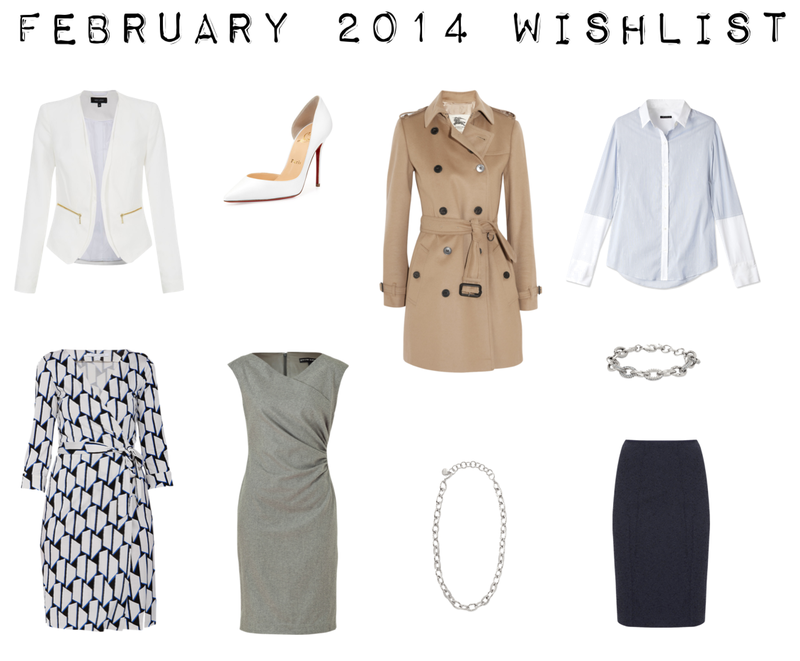 Today's post has some great ideas in trying to organize your wardrobe and shopping habits. Thank you for sharing your ideas and wisdom. This is so interesting! I love hearing how people choose what clothes to buy. Those are some great guidelines on how to decide what your wardrobe needs. I have no problem finding clothes to buy ;o) My problem seems to be getting rid of items in my closet. How do you keep your inventory manageable but still have enough to work with when trying new inspirations? Really enjoyed this post. Thanks for taking the time to write it. I look forward to the subsequent ones! I am definitely going to add some white pumps for this coming spring and summer. Also, I'm looking forward to seeing what you do with your sheath dress. I love them, but have a bit of trouble coming up with a big variety of ideas! This is genius! I made a “Defining my style” board of inspiration I already own. I should do a shopping one too. This is a great post. Thank you for writing it. It gave me some great ideas for putting more structure in my shopping. I have no problem buying items I like but when I get them home, I can't always fit them into my wardrobe. Hi! I was wondering if you could say where the blue and white dress and the gray sheath dress pictured above are from? I LOVE them. I am very impressed with this post about shopping. I just “buy things I like,” which means my wardrobe is very disorganized!!! Glad you liked it. Working on a few more to try to give the end to end process I (mostly) follow.